Actually, scratch that, the race was 101.4 miles and believe me, every single step of that 1.4 miles was felt. Either way, it was a 100 mile PR for me and overall, I had a pretty smooth race. And the miracle of all miracles is that my stomach cooperated with me as for races of 50 miles and over, I end up having to slow down to manage that. I started out the race on 250-300 calories per hour, whether I was hungry or not. That consisted of a 100 calorie GU gel and the remaining calories were from various “real food” options, like some awesome aussie bites with a ton of calories in them, my own boiled potatoes, etc…I basically ate what my body craved – and at RDL it craved real food. I even ate parts of a breakfast burrito at one of the aid stations at mile 90, along with a hot cup of coffee. After around mile 50, however, the thought of taking in another gel made me want to hurl, so I substituted a gel with a GU/Cliff block, which helped as it gave me the glucose I needed but not the consistency of a gel. I have to say though, during the last third of the race, I was definitely not taking in that many calories, but just relying on the chomps and whatever bites of food I could take in at aid stations, trusting that the fact that I took in a lot of calories during the first half was still enough. Whether I could have had a better race because of that, I will never know. All I know is that I wasn’t feeling nauseated during that last stretch, which was a godsend. That said, of course I felt moments of low energy, fatigue, being over it and a bit of nausea over the 100 miles, but I quickly managed to “manage” those moments and get over them. 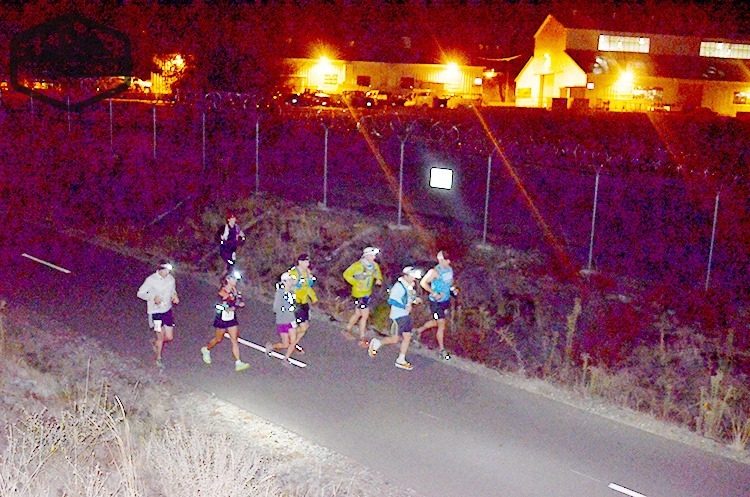 That is key during an ultra marathon. For a 100 miler, it takes a village to get someone across the finish line and this year my crew and pacers were badass. Good friends of mine, who know my strengths and weaknesses, but also pretty legit ultra runners in their own right. Our own Joe Condon, who has crewed and paced me before and has been there for me through thick and thin, even during my DNF at the Waldo 100k. My friend Jamie who paced me at this race last year and who is a pretty talented road and ultra runner himself, Gordy Ainsleigh, the father of ultra running, who everyone knows I got to know well this year and who camped out with us the night before at the start. It was cool hearing his stories about running the Western States course for the first time and just having his support. Finally, my friend Sandra who had an amazing ultra running year this year and who paced me so well from mile 51 to 85. She really really got me to run during the most difficult parts of the course, passing a ton of struggling runners along the way. My day started out with a 2:30 wake up call. I am crazy that way. I need time to get my bearings, feel like I’m not in a rush, have coffee, eat, and slowly get my stuff ready – that quiet time is really important to me. My crew members slowly showed up in Joe’s airstream, the first one being Gordy – I remember asking him, with a sigh before my first cup of coffee kicked in, why he decided to run 100 miles that first time and to that question he answered “because it was there”. An honest answer and pretty cool to hear about an hour before my own 100 miler was to begin. Anyway, they know that I tend to show up ridiculously early to events, when there is no need to. So although the race started at 5:00 am and was a mere 5 minute walk from our campsite, I told them I was thinking of arriving there at 4am, at which point I got these puzzled looks and thank god that they were able to convince me to leave at 4:30 instead. It was dark but not too cold when we left – they helped me distribute my drop bags and hung out with me a bit and then I was off. Although the nerves hit me about a half hour before the race, they were quickly filtered down after seeing lots of other friends who were running, milling around at the start. Everyone was out there, either running it, crewing or pacing. 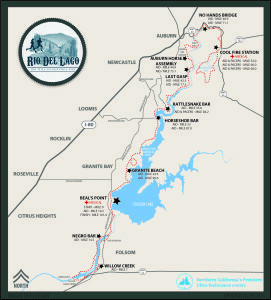 Rio del Lago is the last Western States qualifier before registration for the lottery, so running and finishing this race was that much more important to the runners. Luckily, I had already secured my qualifier earlier this year at the Miwok 100k so at least I didn’t have that pressure. Below is a picture of me, second from the left, during those first few miles. 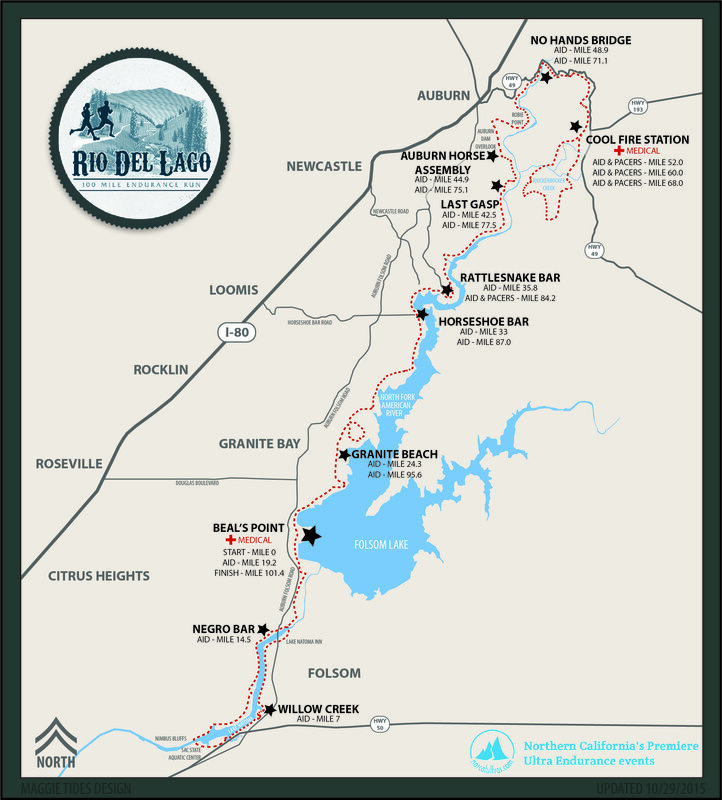 This year, the race was held on a new course, incorporating a lot of the old course, but also incorporating a lot of pavement for the first 18-19 miles. This can be a good and bad thing. It can be good in that it can lead to a faster time, if one is careful with the pacing. Or it can really screw up your race as it is very easy to go out way too fast, which is what I witnessed along the way with other runners. I just kept thinking to myself “after these 20 miles, you’ve got another 80 – take it easy, veronica”. My coach also told me to think to myself “is this pace sustainable for the entire 100 miles?” Was I pushing too hard? Should I pick it up a bit? I needed to run my own race and not worry about other runners around me. Again, after these 20 miles, I had 80 more miles left. The terrain changed a lot along the way. From the pavement to smooth rolling trails, to steep gravelly uphills, to rocky downhills. So there were lots of pace adjustments made. Saw many many familiar faces along the way. From Jessi and Debbie with their cowbell and encouraging words, Jill Cole and Dan Burke who came up and gave me a hug at mile 35, Tony Nguyen (otherwise known as “endorphin dude”) who I saw a million times along the course, snapping pictures of us with his Batman suit on. Eric Toschi who ran the Horseshoe Bar aid station and who stopped me as I was leaving it at mile 32 and said “you look good but I want you to eat more before you leave this aid station – I know the look on your face”. So I listened to his instructions and did. Erica and Leigh-Ann who ran with me through a stupid section (I call it stupid because I you have to run that stretch after mile 85 in the dark when you’re tired and over it) called the “meat grinder” and who witnessed my epic fall, Tom Flahavan who saw me during one of my low points before arriving in Auburn and who offered to drop a few f-bombs to make me laugh- and he also gave me a good strategy on how to handle my nutrition based on the terrain coming up. It worked! High points were: 1) seeing my crew at major crew stops where Joe and Jamie were like no-nonsense ER doctors, laying out my drop bag contents and then refilling my pack while I went to eat at the food table, 2) feeling a surge of energy on my way up to Cool (from mile 45ish to mile 51 and passing a ton of people, 3) still feeling that surge of energy while tackling the 2 mentally difficult 8-mile washing machine loops in Cool in the freezing temps and basically knocking those out smoothly, 4) knowing that I was moving up in placement throughout the race, instead of it being the other way around…Low points were: 1) moments of negativity at the thought of the amount of miles that lay ahead of me, 2) having to maneuver through the meat grinder after mile 85 with half a brain left – it was eternal and just mentally painful, but I had Joe to pace me through it, 3) when my headlamp suddenly died and I realized that I had no back up batteries (a lesson to everyone running a 100 miler!) and had left my handheld in another drop bag! For some reason I had it in my head that 5 hours of battery life would sustain me through the night! Luckily, Sandra gave me her handheld and then basically ran next to me without being able to see where she herself was running. However, we ran into 2 nice runners who selflessly gave me their extra batteries and I was set again. Crisis averted on that one. Sandra and joe were so so patient while pacing me and just kept me running and hiking the hills and looking for roadkill to pass 🙂 I do recall running a lot of the uphills towards the end, though as I was just on a mission to finish the thing. The last 4 miles were tough and I developed somewhat of a bad attitude (poor Joe) but I still kept trying to run, stuffing orange wedges in my mouth by the handful (yes, about 10 of them at the last aid station, followed by a shot of hot, salty chicken broth Joe kept giving me, to wash it down). The finish was a relief and I was starving. At the breakfast station, the volunteer asked me “what can I get you?” to which I replied “a million cups of orange juice, a coffee with milk and sugar and an entire plate of bacon please”…Sandra was like an angel, tending to me, holding my coffee and held my stuff while I tried to sit down at the picnic table. Afterwards, Gordy got me another plate of eggs and insisted that I put on his sweats, which was a good idea as I got cold fast. Sandra then drove me to the campsite, I had more coffee and then packed up and checked into the hotel in Folsom where I was going to spend the next night, to chill out. That night at dinner I recall walking ridiculously slow, in order to mask my “real” 100 mile walk. So now, as I write this, the memories are fading but the feelings are still strong, post 100 miler. I am on week 3 of a 4 week running break and am missing the endorphins a lot and going a little crazy, but I am also enjoying the time off to spend with my kids and just focus on being a mother and getting other personal stuff done. When you’ve doing as much training as I have done this past year, stuff gets ignored, yet I realized that I have operated at 110% velocity for most of this year and it is foreign to me to just chill out. But I’m working on it. Maybe it’s time to buy some normal clothes, look like a girl again, get my haircut and styled, get a pedicure once a few toenails grow out (yup), even out crazy and blinding farmers tans and go for some fun runs with friends.